1. Simply fill out the information requested on the sign up screen. You do not need to provide your billing information now. 2. Upon completion you will be brought to your schedule page. 3. You can schedule a future session or request help immediately. Tutors are available on demand or for pre-scheduled tutoring sessions any time. It is recommended that you request a session as far in advance as possible, so that we can locate the best tutor to fit your needs. But if you need a tutor now, we can help! How much does it cost? Information on Tutoring Plans. We have economical options for every student. Students can pay by the hour for just $40 or subscribe to one of TutaPoint's monthly plans, which start at just $115/month. You can cancel anytime. To cancel a monthly tutoring plan: sign into your account and select My Account from the menu. Deselect the Monthly Tutoring Plan you are subscribed to. Want to pay as you go? No problem, we also offer tutoring for just $40, which is billed directly to the credit card you submitted on the application. Billing is done using 5 minute increments, with a 15 minute minimum, so a half-hour session costs only $20. Who are the Tutapoint.com tutors and where are they based? The first step in providing an excellent tutoring website is to find excellent tutors! TutaPoint.com works with teaching professionals from all over the United States, including certified teachers, retired teachers, teaching assistants, professors, and others who are passionate about teaching one or more of our subject areas. Want to take a look at our tutors? Click here. 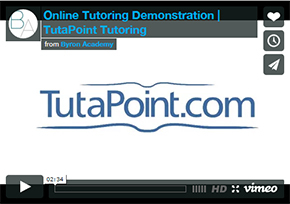 Unlike other large online tutoring companies, TutaPoint.com uses only US based tutors. Our tutors deliver instruction using the rhythm and explanations our students require to achieve excellence. Are the sessions monitored? By whom and how often? Yes, our administrative Web team routinely monitors tutoring sessions on a daily basis. What happens if we need to cancel a scheduled session? Simply log-in and view your scheduled sessions. Find the session you wish to cancel and hit the "Cancel" button. If we miss a scheduled session, will we be charged? Yes, all sessions must be canceled with greater than 4 hours before the session is scheduled or you will be charged for 30 minutes of tutoring time. To ensure we are able to retain the highest-quality tutors, we must guarantee tutor pay at some measurable point. Do scheduled sessions cost more than spontaneous ones? No, regardless as to whether the session was scheduled or spontaneous, the fee is the same. See Pricing for details on our rates. Yes, when scheduling a session, type in the username of the tutor you wish to be paired with and priority will be issued to that tutor. However, if that tutor is not available, you will be paired with the next available tutor that meets your needs. To review our list of tutors simply click here. What is the minimum length of a tutoring session? The minimum length of a session is 15 minutes. After the first 15 minutes, you are billed for every additional 15 minutes of live tutoring provided. Can a session be paid for by check or money order? Unfortunately no, sessions must be paid by a Visa or MasterCard card only. When a student registers with Tutapoint.com, a credit card number is put on file. For every tutoring session, the credit card account is billed. How do I change my billing credit card number on file? Log-in and click on Account Settings from the student options under the Welcome Back sign. Once on the Account Settings page, select "Billing" from the top of the screen and re-enter the new credit card information. Remember to hit "Save" before exiting the page. Microsoft Internet Explorer 7 or higher, Google Chrome or Safari. Note: Mac users using Firefox must make certain security setting changes. Our system will prompt you to make these changes. however we recommend that Mac users choose an alternate browser like Chrome or Safari. What if I have forgotten my password and/or login? Simply click on "forgot password" under the log-in screen. If you need further assistance, simply call (800) 390-2370 or e-mail info@tutapoint.com. I have been teaching for over 5 years, and I love being a helping hand to students of all ages. In my career as a middle school teacher, and now as an online tutor, I have had the opportunity to help kids understand and come to enjoy a variety of subjects including: art, technology, math, writing, social studies and Spanish. I am dedicated to assisting students in understanding concepts in fun and creative ways so that they are able to reach their full potential. I like to make sure that each session is stress-free for the student, that they leave having a clear concept of what was gone over and feel positive about the learning process and their progress! I have a passion for teaching as well as learning new things. I am a History Education major at UCO. I graduated from Rose State College with an Associate degree in History. I understand that not every student learns in the same way. I'm always thinking about new ways to teach and to make learning fun! If you choose me as your tutor I will do my best to make you feel comfortable about the subject you're wanting to exceed in. I also love to help students with their writing assignments by giving useful feedback in their writing endeavors. Good luck students! I am a Johns Hopkins University Molecular & Cellular Biology and Anthropology double major and studied Biochemistry at the University of Oxford. I am versed in both the sciences and humanities, and have provided significant tutoring services in Mathematics, English, Chemistry, Biology, and standardized test preparation. I graduated high school as the salutatorian of my class with a 4.00 GPA. I tutored students after school in Mathematics, English, Chemistry, and Biology. I also tutored in ACT prep, earning a 35 on the English and Mathematics sections and a 34 on the Science section. I was accepted to Johns Hopkins University on a full tuition scholarship. I have maintained a 4.00 GPA as a Hopkins student, and continue to tutor undergraduates in science, math, and languages. I am very passionate about teaching and love working with students. I have years of experience helping students in K-12 and in college succeed in mathematics. I am a 2014 graduate of Alabama State University with a B.S. in Mathematics and have worked in the ASU mathematics lab for two years. I currently serve as a volunteer tutor at my local library. My favorite part about tutoring is making a difference and knowing that I am helping students reach their educational goals. I am a software professional holding a Masters in Electrical Engineering from San Jose State University, CA. Tutoring and Teaching maths is my hobby and I possess a high level passion for teaching maths. I have been into teaching and tutoring maths from around 14 years. I have helped understanding the concepts of mathematics in all the areas to the students using a variety of approach. I have helped to students secure the highest of the scores in Mathematics in school among their peers, SAT, ACT and GRE exams. I am here to help anyone who needs to excel and finding it difficult to have a command on any area in mathematics. I can assure that after you would work with me, you will be confident like never before. Hi, students and parents! I'm Rebecca, a writing and English tutor with 12 years of experience. I am a College Reading & Learning Association Master Level 3 tutor. In addition to tutoring, I have directed tutoring programs at two universities and taught college reading and composition at two universities and four community colleges. My favorite thing about tutoring is creating a customized set of a goals with my tutees. It is exhilarating to see my students reach the goals they have set for themselves and have fun in the process. Yes, you read that right: fun! When I was in high school, I needed tutoring to pass my math classes every year, so I understand how it feels to be in that boat. Tutees spend a lot of time with their tutor, so I think it should be time that they look forward to. I make the time pass quickly with encouragement, creative methods, and a sense of humor. I only use positive reinforcement with my tutees, authentically building their confidence and helping them become independent learners. So what are you waiting for? Let's get started! I look forward to meeting you. I have been a SPED Instructional aide locally for the past three years. I was in the classroom off and on for 4 years before working for the school district because of educational college courses. I tutored one student from her second through fourth grade year one day a week for an hour and a half. A strong passion of mine is helping people when they are struggling and especially if it’s elementary education or technology. I make learning fun. I know I felt frustrated going through school and felt like I did not have anyone to turn to for help. I dislike seeing people struggle through life when I know I can help them. People frequently come to me when they have problems with technology. I ask them what their end goal was that they were trying to reach. Then I ask them to step away and let me look at it. Then I have them come back over and I show them step by step. I even have people take notes as they are working through the problems that way they an reference them again. My experience as an educator has provided me with a solid understanding of school structures and what is involved in creating an effective learning experience. In addition, I also have extensive experience in human resources, writing, editing, communications, customer service, and insurance production and sales. My education includes a Bachelor’s in English and a Master’s in English Education, both obtained from Piedmont College. It is my desire to help you achieve your academic and professional goals. I sincerely look forward to working with you! As I have tutored and taught people, I have come to realize that not everyone can easily grasp a concept because we are all wired differently. We all have our strengths and weaknesses. With that in mind, I have become more patient with people. After all, the process takes time. If you have a question, then ask away because the dumbest question is the question not asked. If you ask me a question, I will gladly answer it and give you my most honest answer. Hello! My name is Bronte! I am so excited to be sharing this journey with you to help you master one of the numerous subjects that I teach. Math has been one of my favorite subjects to teach and I have been doing it for about three years in public/private schools, online institutions, and personal tutoring. I became a licensed ESL instructor three years ago and have been working with several online institutions teaching English to different people of different cultures. I have thoroughly enjoyed my experience so far. If you feel like learning a new instrument, I highly recommend piano. I am a little biased because I have been playing it all of my life and teaching it for almost five years. I am trained in the Suzuki method which is the most effective learning technique. I maintain a positive energy in my classes and am always eager to help you reach your goals! I promise you will have a blast learning from me. First started helping my fellow classmates in Chemistry, then they all graduated. I like to help others achieve success and not only that, I am great at teaching, which most people are not good at. I have put the hours and hours of studying in for every class. Even if you are taking 18 credits you can still get all As with me! I attended the University of Dayton in which I graduated with a Bachelors of Biology and a Masters of Education. I have a very strong science background specializing in Biology and Life Sciences. I have been teaching for 4 years in Cleveland, Ohio. My students really engage in my lessons because I am able to connect Biology to real-world examples to to their lives. In my classroom I focus on catering to students individual learning styles and using a differentiation style for each student. I am a high school math teacher who loves working one-on-one with students to help them understand math rather than memorizing it. I love using weird and funky examples to help each student learn the best way possible since that is what my sister needed when I began helping her. Math is amazing and so much fun when you begin to explore it! I am ready to learn alongside and watch every student grow to be a better math student. I have tutored my classmates for Cell Biology and Biochemistry to clarify concepts and diagrams. In high school, I had been teaching drawing to my friends during the school year and I also gave piano lessons to my brother every week. I am interested in teaching because of the opportunity to share my knowledge with those who need better strategies for learning the material. Jonathan Le studied engineering at the University of Houston and proceed to work in an academic development industry. As an engineer, his science and math knowledge is immense. Passionate about helping others, online tutoring was a perfect fit for him. Throughout his tutoring careers, he was able to help many students beat their ultimate nemesis, Science & Math. And now, he will able to help you do the same. I am a professor of economics. I have several years of teaching experience.